When it’s about international trade, normally Government of various countries intervenes in the name of protection. It is a policy of the government, to protect domestic industries from foreign competition. You often heard the terms tariff and quota, in this context. The tariff is a tax on imports while quota is a sort of quantity limit set on imports. However, they do not outrightly influence the domestic business operations. 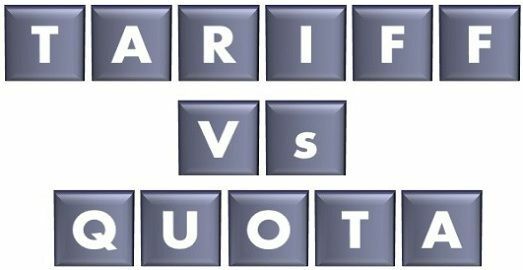 As both are the methods used by the government to reduce imports and encourage exports, it is hard to elaborate the difference between tariff and quota. Nevertheless, the terms are different and explained in this article in detail, have a look. Meaning Tariff refers to the tax levied on import or export of goods. Quota refers to the restriction imposed on the quantity of goods imported. Effect on Gross Domestic Product Increases GDP. No effect on GDP. Results in Fall in consumer's surplus and rise in producer's surplus. Fall in consumer surplus. A kind of tax, which is paid on the import of goods and services. It is used as a tool to limit trade, because, tariffs increase the price of foreign goods and services and thus it makes them more expensive for the customers. It is levied by the government to increase revenue and also to protect domestic companies against foreign competition, as the customers will get attracted by the imported goods if they are comparatively less costly. It acts as a barrier to free trade between nations. Ad valorem tariff: A certain percentage of tariff calculated on the value of imported items. Specific tariff: A specified amount is charged depending upon the type of goods. Quota refers to a defined upper limit set by the government, on the number of goods or services imported or exported from/to other countries, in a particular period. It is a measure used in the regulation of trade volume between nations. Quotas do not generate revenues for the government, but aims at encouraging the production of goods within the country; that helps the nation to become self-sufficient and decrease dependency on imports from other countries. In this way, quota helps in reducing imports and thus, protecting own industries from foreign competition. The tariff is a tax charged on imported goods. The quota is a limit defined by the government on the quantity of goods produced in the foreign country and sold domestically. Tariff results in generating revenue for the country and hence, increase the GDP. As opposed to quota, is imposed on the numerical value of goods, not the amount and so it has no effect. With the effect of the tariff, consumer surplus goes down while the producer’s surplus goes up. On the other hand, quota results in the fall of consumer surplus. Income generated from the collection of the tariff is the revenue of the government. Conversely, in the case of quota, traders will get extra income from the collection. After reviewing the above points, it is quite clear that these two terms are very different. Although there are some similarities, like they both acts as a tool that seeks to control the international trade and encourage the production within the home country, for the purpose of making it, self-sufficient. who gets to keep taxable tariff monies collected ?